Heavy duty composit tiles are long lasting economical, suitable for werehouses, shopping centres, homes, Office, hotel, shops, schools, Restaurants, Hospital and light industries. VCT tile or homogeneous vinyl tile. Available in 2mm and 3mm. Used for all purpose. Residential and Commercial. NCR. Ready stock for immediate delivery. Our company has set benchmark in offering Luxury Vinyl Tile. we are dealing in Vinyl Tile. Owing to the wide experience in this domain, we are instrumental in offering Vinyl Carpet Tile to our clients. Our company is the major company known for providing Vinyl Ceramic Tile to the clients. This product is best known for sturdy construction, perfect finish, mesmerizing design and many more attributes. 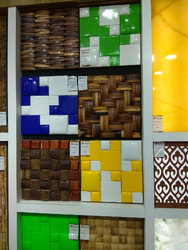 Vinyl Ceramic Tile is carefully manufactured under the guidance of experienced professionals using top quality material. Matching up with the ever increasing requirements of the customers, our company is engaged in providing Modern Stone Flooring.